For animals, there's nothing she won't do. Deep in the wilds of Alaska, wealthy poachers kill bears for entertainment, an age-old bloodsport for the biggest, rarest trophies. Special Agent Poppy McVie and her partner, Dalton, go undercover to take them down. But to play the part, Poppy will actually have to hunt. Sure, she can handle a weapon, but use it on an animal? Not only that, this time around, she’s posing as Dalton’s sister. Can they hide the passion that’s been building between them? Review: The best of the series! Poppy McVie is passionate about animals and her job. 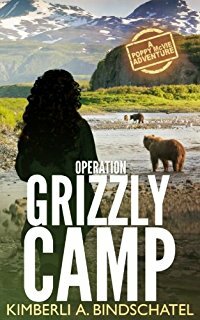 After a successful mission in Norway, Poppy and Agent Dalton are sent to Alaska to help take down a bear poaching operation. Traveling as brother and sister, Poppy will be required to hunt for sport as part of her cover-will she be able to handle it? Before long, that becomes the least of her worries as she and Dalton are fighting for their lives. I really enjoyed this one. Poppy has grown on me throughout the series and I enjoyed the organic development of Poppy's relationship with Dalton. Like the previous books, the reader learns a lot about illegal bear poaching. The plot was fast paced and the most interesting of all the books so far. Overall-best of the series, a fun read.